Energy efficient hand dryers began to come into the market in 2010. For the first time hand dryers have been designed to dry hand in under 12 seconds and truly use less power to do it. In 2010 two manufactures introduced hand dryers the use about a third of the power tradition electric hand dryers use. Some hand dryers use more that 1700 watts of power and take 30 to 40 seconds to dry hands. 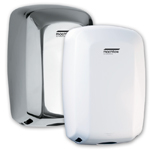 American Dryer introduced the eXtremeAir EXT hand dryers. These were the first truly energy efficient hand dryers, using only 540 watts to dry hands in under 12 seconds. 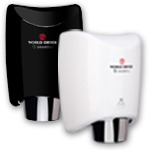 World Dryer Corp introduced the SMARTdri hand dryers. These energy efficient hand dryers allow the end user to adjust the heater on and off, and has three setting for the blower. These hand dryers can be set with the heater off and on low speed which uses only 400 watts of power. However, to dry hands in less than 12 seconds, the dryer will be set to use about 800 watts.